Happy Valentine's Day! Whilst most people don't celebrate February 14 for various reasons, it didn't feel right to not address the occasion at all. Having said that, Andre and I actually have no plans for today; I'm spending my day shooting some new content whilst he's spending his at work, we'll probably just have dinner tonight which is what we do most of the time anyway. Although I must admit, I am hoping for a cute card because I'm one of those people who saves cards year after year! Following on from my previous post about choosing scent to help make memories last, another way of making them last is by capturing them. 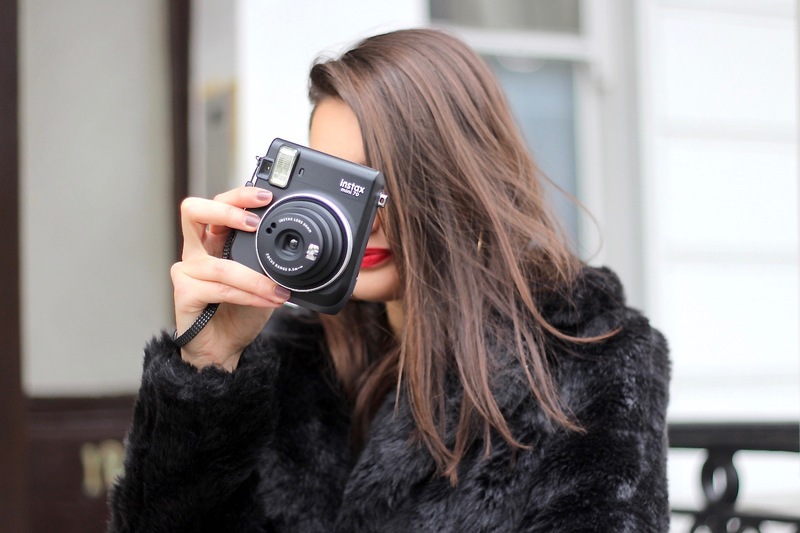 Since getting the Instax mini 70 for my birthday in December, I've been wanting to use it to capture memories instantly but I must admit, I get quite nervous about using it because I don't want to waste film (packs of 10 are around £15 which isn't cheap!) I want to make it my goal to use it as often as I can. Now, all that's left is to convince Andre to take some photos with me! In 4 years we probably only have 4 nice photos to show for it so taking cute couple photos is next on my to-do list. Onto my outfit (because it feels like I haven't properly talked about what I'm wearing in yonks). This outfit is a dressed up version of what has been my daily getup. 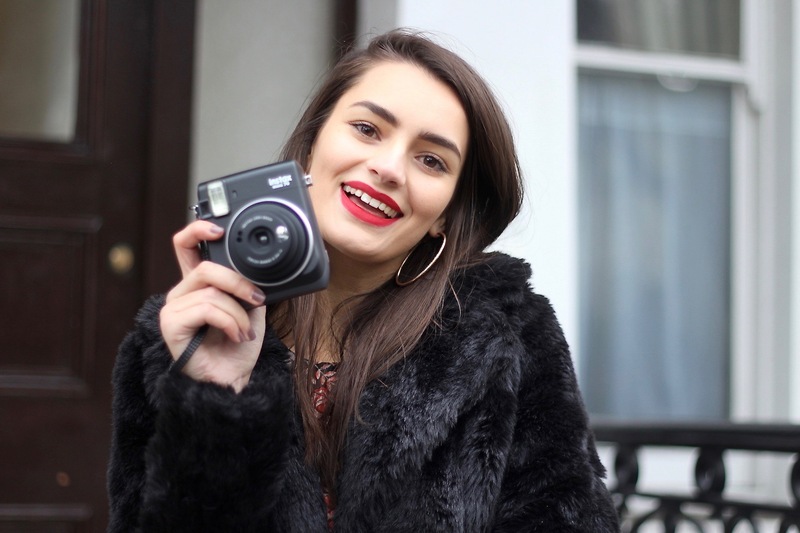 Starting with my faux fur jacket which, if you didn't know already from my Instagram, is a real oldie my mum bought for me to wear on my 16th birthday and has been hanging in my wardrobe ever since, unworn. 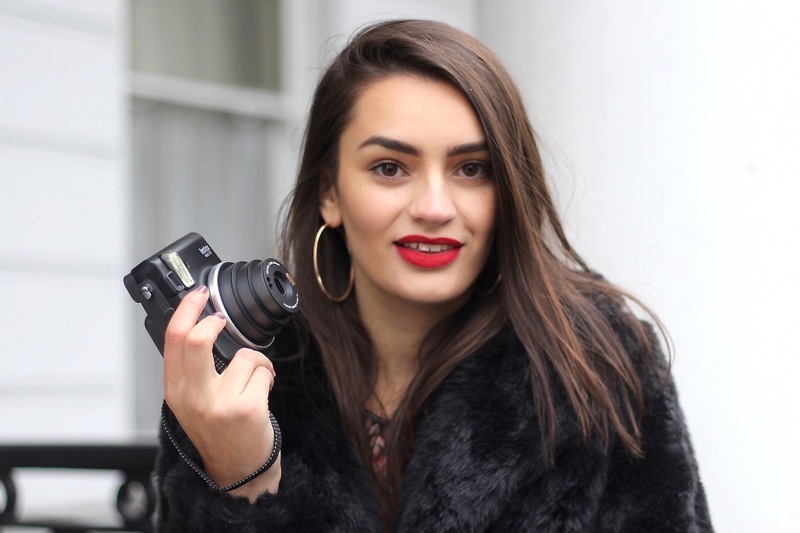 I'd been seeing so many of my favourite bloggers wearing amazing faux fur jackets recently that I decided to give it a go myself with what I already had in my wardrobe and I practically haven't stopped wearing it since! Rather than a jumper, which is usually what I gravitate towards, I chose a red floral top, perfect for Valentine's. 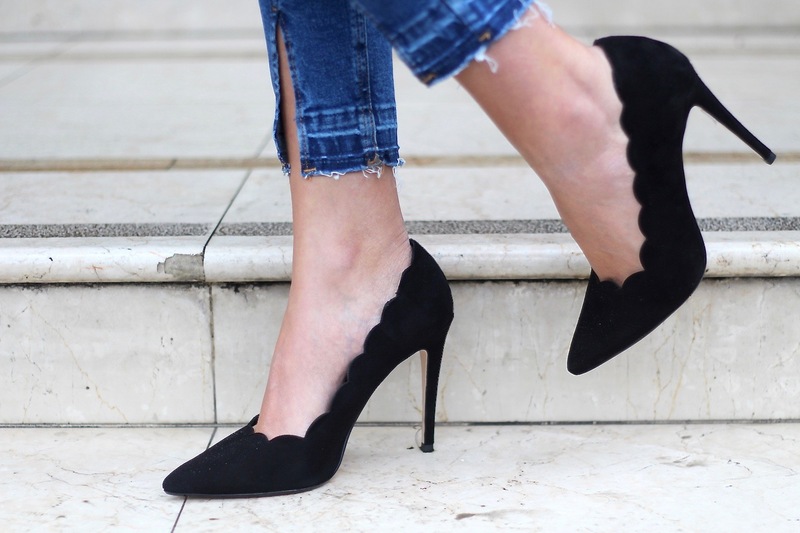 Paired with a new pair of jeans from Topshop and new suede heels from Dune which have a gorgeous scallop trim, making them the perfect heel for a winter evening when it's still too cold to get your toes out. 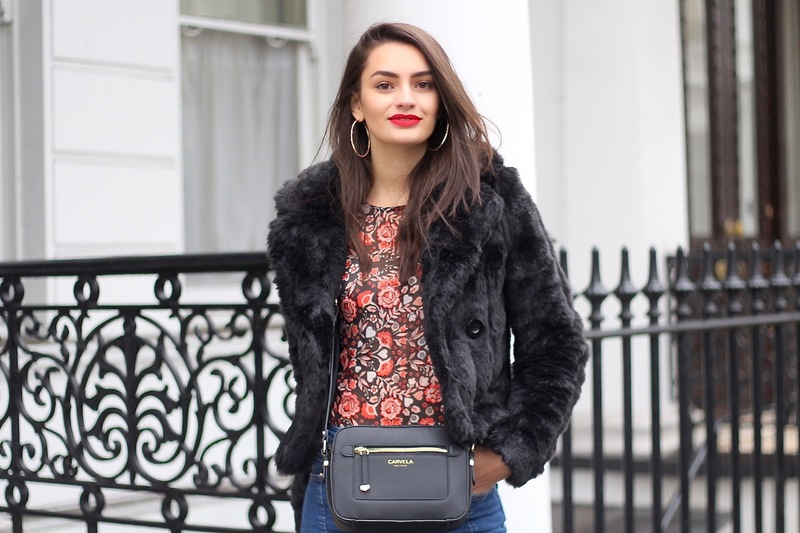 I also got a new crossbody bag from Carvela via Shoeaholics which I'm completely obsessed with so, without a doubt you'll be seeing it loads! 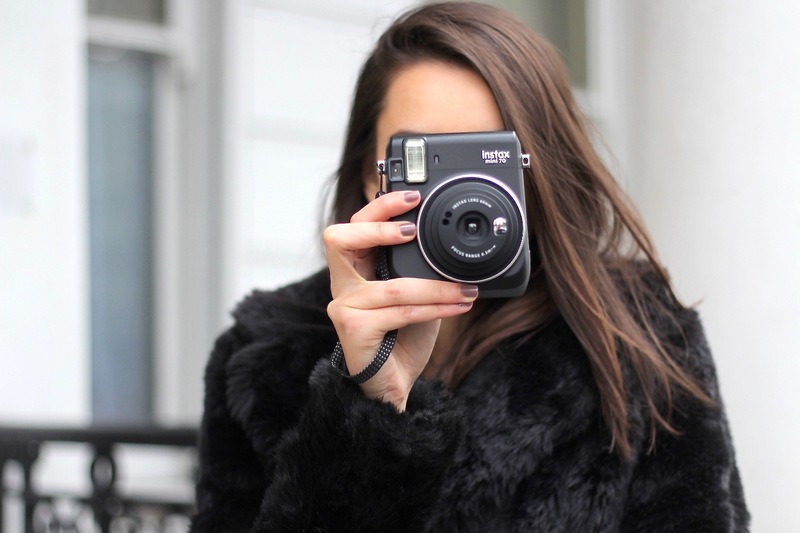 I've always wanted an instax camera, but what put me off like you mentioned is the price for the print paper! Lovely outfit and hope you have a lovely Valentine's Day!